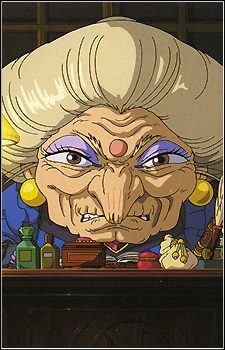 The evil, greedy witch that runs the spirits bath house where Chihiro is forced to work. She is known to be very powerful and has the ability to turn into a bird. She has a very large son whom she takes care of at the bath house and only shows her nice nature to him. When people begin to work at the bathhouse she signs a contract with them in which she changes and takes their name. Spirited Away: Is Yubaba the witch really as bad as she seems?